Keeping in mind ever-evolving requirements of our respected clients, we are offering a premium quality range of Glass Condenser. 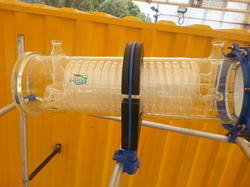 Coil type heat exchanger is mainly used as condenser or cooler. It can, however, be used for heat transfer between liquid and gases in general. It has the coil battery welded to the jacket making a one piece unit. The maximum allowable pressure in the coil is 2.7 bar gauge. Aimed at prosperous growth in this domain, we are instrumental in offering an excellent quality range of Coil Glass Condenser. Overall Length mm: 250mm. Also available 300mm, 350mm, 400mm, 500mm etc. 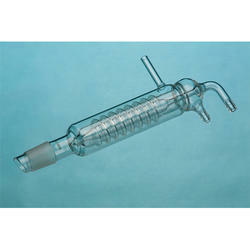 Quality being the sole concern, we offer an extensive array of Glass Condensers that are durable in nature and have high strength. Our entire product range is performance based and is quality approved. Our entire product line is as per eh set industrial standards prevailing in the industry.